» home » magazine » 2009 » march 2009 » is welding automation right for your operation? Is Welding Automation Right for Your Operation? Kevin Summers is business development manager, robotics/automation for Miller Electric Mfg. Co., Appleton, WI; tel. 920/734-9821, www.millerwelds.com. Rob Ryan and Thomas Jaeger are, respectively, product manager, automation group, and engineering manager, R&D and new product development, for Tregaskiss, Windsor, Ontario, Canada; tel. 519/737-3000, www.tregaskiss.com. Achieving the many advantages of an automated welding cell first requires careful assessment of current welding processes, and a detailed plan to automate. setup or a robotic production cell, automating the welding process can increase productivity, improve weld cosmetics, reduce materials costs (by reducing over-welding), reduce energy and manpower costs and improve reliability, all with the promise of a rapid return on investment. But attaining these advantages depends on how well-suited the process is to automation in the first place. Variables determining automation suitability include the design of the parts to be welded, part volume, the facility layout, incoming power and personnel. Automated welding systems are built for speed and thrive on repeatability. 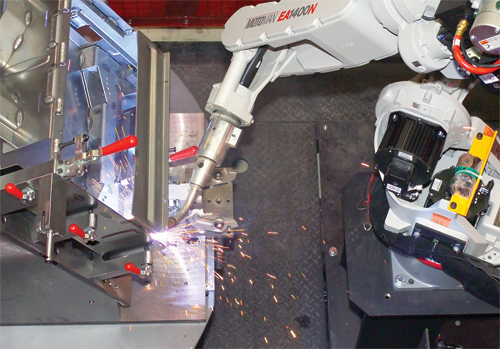 Parts that present gap, fitup and access challenges will quickly hobble an automated welding process, as will a part or assembly that requires intricate clamping and tooling to hold it in place. As a rule, a welder als will perform better than a robot or fixed automation on assemblies where weld joints are obstructed or where a part requires precarious placement. Instead, to successfully automate, the parts manufactured upstream from an automated welding cell should be as simple and consistent as possible so that the robot can execute its welds at the same place, repeatedly. If a weld joint moves, a robot will not be able to weld it. To determine a robot’s ability to weld an assembly, supply your robot OEM or welding-solution provider with a blueprint of the parts and assembly, which indicates the expected fitup repeatability of the assembly. Ideally, provide an electronic CAD drawing of the parts that robot OEMs can import into simulation software. This helps engineers visualize the weldment and determine how they might fine-tune the assembly and tooling to optimize an automated-welding process. Metalformers also should, prior to automating, assess their parts flow. To implement automation and relieve bottlenecks at the welding cell, avoid delays in upstream part fabrication or rework before sending parts to the welding cell. Also ensure that any operations required to supply the automated welding cell can match or exceed the welding cell’s cycle time. Lacking any of the above-described preconditions, metalformers might look for assistance by requesting that their automation-equipment supplier recommend solutions for upstream applications. For example, automated handling equipment can be equipped with part-recognition systems to enable the equipment to pick up parts, manipulate them to the correct orientation and deliver them to an automated welding cell. If fabricators doubt the consistency and cycle times of their manual upstream processes, they might consider this option. With fixed automation, a welding torch rotates around a fixed assembly, or vice-versa—the assembly rotates around a fixed torch. For example, some fabricators employ a lathe-type automated-welding setup where the fixtured assembly is spun, welded and ejected from the process. Or, the torch advances in a straight line to make, say, a 6-in. weld and then retracts to a neutral position in preparation for the next weld. Fixed automation proves extremely efficient and cost-effective. Robotic-welding cells execute complex programmed motions in space to perform welds. Welding guns mounted on robotic arms with articulated joints can reach, rotate and pivot to gain access to the assembly. Metalformers select robotic automation when they anticipate frequent job changes or the production of particularly complex assemblies. Robots offer the flexibility to be reprogrammed and retasked as the company’s needs dictate, making them the preferred automation choice for many manufacturers. To justify an automation investment, companies need to ensure that their part volumes are high enough, as a robot’s key benefit is the ability to produce high volumes of quality welds. Realistically, however, even though many small fabricators may lack such high volumes for any one assembly, these facilities may be able to automate two or three smaller-volume applications and program a robot to weld those different parts instead. Part volume is a critical factor in estimating return on investment—labor comprises as much as 75 percent of the cost of a semiautomatically welded component. Accordingly, even if a metalformer plans to produce the same number of parts, it may be able to justify the investment due to the amount of labor that an automated welding process can eliminate. Facilities need know how much space they can devote to fixed automation and robotics, as the physical footprint of these cells and the amount of space required for the flow of raw materials exceed that of semiautomatic welding processes. Although welding automation can consume large portions of a plant’s real estate, small facilities still can make automation work by purchasing fewer pieces of automation equipment, programmed to perform multiple tasks. They can outfit robots with various toolsets that enable them to work on a number of different assemblies, while occupying a relatively small footprint. Additional welding power sources and ventilation probably will be needed when integrating automated cells. The optimum power supply for a fabricator that employs automation is 480-V three-phase. The facility also needs to consider bulk delivery of welding wire and shielding gas. Instead of purchasing 40-lb. spools of weld wire, for example, a metalformer might purchase 600- or 900-lb. drums. And, in terms of shielding-gas delivery, the priority is to optimize robot run time by investing in manifold systems that eliminate the downtime associated with frequent gas-cylinder changeout. Many manufacturers, after they’ve decided to implement automation, opt to work with a third-party system integrator, knowledgeable about all aspects of facility modifications required for automation. Integrators also can help with important safety regulations that apply in the fabricator’s region, country or state, in addition to those specified by OSHA and the Robotic Industries Association. Automation doesn’t necessarily imply complete independence from human insight and supervision. Metalformers should assign a skilled welder, who knows the process, the tasks of programming the robot or fixed-automation system, and troubleshooting the process as needed. Otherwise, facilities should be prepared to vet robot OEMs to determine the availability and costs associated with OEM-based training of their personnel. Some automation companies may offer deals that include training for high-volume purchases, and companies can expect this training to last one to three weeks depending on the certification level desired.